I grew up in a household full of music but it did not include popular hits on the radio. Maybe this was because I had no brothers or sisters at home with me, which meant I was never driven in a car by and never walked past or into the room of an older sibling who listened to the radio. My dad and I used to sing from one of his old camp song books. Our family attended many musicals at the Black Hills Playhouse in Custer State Park and the Ordway in St. Paul and then we listened to their soundtracks. My brother Steve sent tape recordings from Minnesota and later Virginia of him playing his guitar and singing–mostly blue grass and old folk songs. And in the pews at Custer Lutheran Fellowship I learned to sing liturgy and hymns. The most significant gift my mother brought to the music of my childhood was the Beach Boys. I listened to their tapes over and over. I memorized the songs but sometimes had trouble singing along, challenged by which voice I should join amidst those tight harmonies. Like their early fans, I loved both the music and the way I felt when I heard it. Then in high school I started listening to songs by the trio Wilson Phillips, which includes two of Brian Wilson’s daughters. I learned from them and from my mother that the Beach Boys story was not all fun, fun, fun. 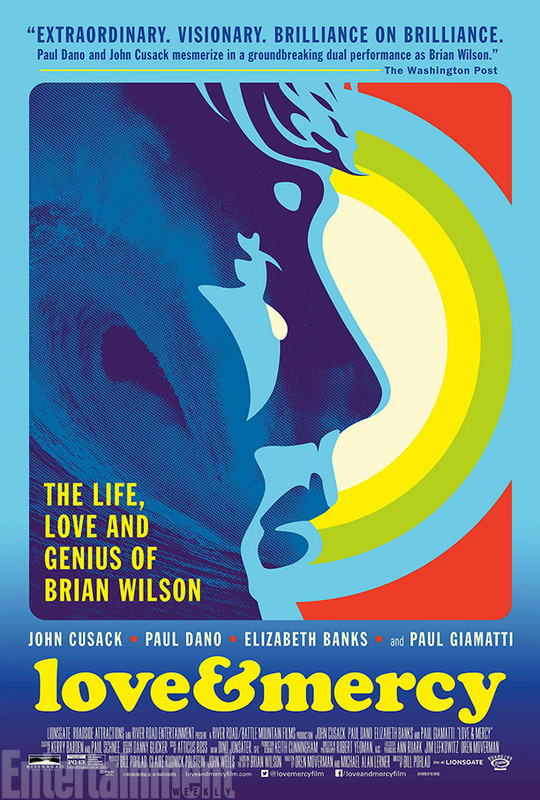 It included tragedy, brought to life in “Love and Mercy“. Director Bill Pohlad tells the story of Wilson during the 1960s, when he was in the middle of creating “Pet Sounds,” and 1980s, when he was being treated (badly) for mental illness by Dr. Eugene Landy and falling in love with his second wife Melinda Ledbetter. 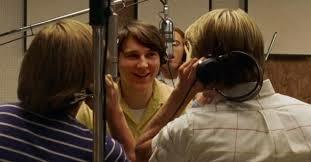 Paul Dano, as the young Brian, made me laugh and nearly cry and John Cusack, the older Brian, is in fine form finally. It would have been easy for either actor to be over the top but their performances are balanced. We only see the Beach Boys perform onstage during an opening montage because the band’s life on the road is not the story being told. Wilson’s scenes in the studio were the highlight of the film for me because that’s where his genius came alive and where he experienced great joy. Dano’s performance invites us into the studio with him but he also drew me into the darker scenes, the times and places when Wilson was misunderstood, at best, and abused, at worst, by his fellow band members and father. I’ve admired Elizabeth Banks since she played Marcella Howard in Seabiscuit and her work here as Melinda is first rate. Paul Giamatti as Dr. Landy? Throughout the film the friend next to me was cussing at him as quietly as she could and I wanted to scream at him, both of which are praise for his portrayal. This is in many ways a film about death and resurrection, of brokenness and evil transformed by love. Melinda and Gloria, Wilson’s housekeeper played by Diana Maria Riva, call out the evil they witness and find a way to confront it. There’s a wonderful scene in which Melinda has served Landy with evidence of his abuses and he comes to the car dealership where she works in order to confront her. She locks herself in her office, closes the blinds, and listens as Landy yells at her. She can hear his every word and she stares at the door looking satisfied; knowing that Brian’s brother Carl will now intervene. Some artistic liberties may have been taken here but the outcome is the same, Brian was finally set free from the doctor’s control by those who loved him. Would Melinda and Gloria and Carl have fought for Brian if they had not believed they would have a happy ending together? I don’t know. But that is the call of Christian discipleship–to love without expecting something in return, to love the stranger not only our friends, to feed and clothe and house without expecting or anticipating payment or gratitude. We may not get to be part of the transformation that takes place in response to the love given. We likely will not be in the recording studio for that new sound. We might not even be living when the songs are released. That doesn’t make the transformation any less marvelous. It doesn’t make our call any less authentic or serious. The film reminds us of the love to which we are called. I also couldn’t help remembering that I too have been transformed, am in fact transformed each day by God’s gifts of grace and mercy. In my tradition we call that the work of the Holy Spirit. You write a great message and a great movie review also. It’s raining here in Iowa–we can use some moisture for the tomatoes (way too many) that we have planted. I promise a real letter soon and thank you for the lovely card and note.